If Only… sometimes these words are so true… If only I had known a year ago the knowledge that Sue passed on in the 90 mins, my website and business would be in an amazing position by now! Thought provoking and the most up to date and valuable information I have received in a long time…if you think you know the best ways to achieve results on the web and get the best from your website… then you haven’t attended this seminar. The only way me website will fail to achieve results now, is by not putting into action what I have learnt in those 90 mins! If you’re in business and want to achieve results with your website, but think you can’t afford the time and effort, then I would say you can’t afford not to. OMG! Where do I start? I accidentally found Sue, from OMG, on Google+ where I was looking for a solution to my social media issues! Within 10 minutes, Sue was calling my mobile phone and helping me untangle my mess! Her good-natured, GENEROUS spirit was immediately evident and her knowledge was astounding – I literally said OMG at least a dozen times over the phone! I’m in awe and I’m greatly looking forward to a long term working relationship with OMG!!! Daniel’s quite amazing in terms of giving you a whole strategy for how best to use technology, how best to set your websites up so that they actually support your business. He has a rare blend of web development and marketing skills that allow him to do justice to the term ‘growth hacker’. He has been an invaluable resource for growing my own business and helping out with client issues that are beyond my technical expertise. Daniel is an extremely experienced and knowledgeable business man. He has helped me to understand the fundamentals of Growth Hacking and how to incorporate simple and effective growth tools into my business. Daniel is also very personable and a joy to work with. I just want to say thank you for a wonderful week of SEO training. Your knowledge and eagerness of SEO has been great, as has your patience with my MANY questions. You have given me a great deal of excitement about the future potential of our business and you have given me the resources and confidence to start improving our website’s rankings and ultimately our business growth. Thanks again! Sue is caring and extremely knowledgeable. The knowledge she has given me on how to get the best of my website is priceless. In easy to understand terms, she has given me the confidence and support I need to achieve great results with my goals in SEO for my business website. Great course for learning the essentials of search engine optimisation from someone who has done it and clearly loves it. Sue was very enthusiastic and a great presenter. Sue has an amazing talent to look at a situation, whether for a website or a business plan, gain insight, and come up with an effective plan of action moving forward. I have been privileged to work with Sun on several projects and she is great to work with and has a terrific attitude – important factors when choosing a new digital marketing consultant. Definitely recommend the SEO mastery course. I have recently completed the 5 day SEO mastery course with little experience with SEO in the past. The course was easy to understand and keep up with and I gained a wealth of knowledge. Today I had the incredible opportunity to engage in one of Sue’s interactive workshops, specifically with how to get the best out of LinkedIn … what a legend! Sue and Julie explained details in clear, easy to follow language with practical hands-on advice that anyone could follow .. even someone like me. Honestly, I don’t know anywhere else you will find someone who has such a depth of knowledge in their field who really understands HOW to make this work to add value to your business. Now it’s time to play and put into practice what I have learnt – can’t wait! Thank you Sue, you are a blessing and obvious choice to answer any question someone may have in this arena by providing the solutions so many seek from your profession. More power to you! Daniel is one of those people who has a good understanding of how all the parts of your business work together, and applying that understanding to leverage your digital assets as a tool to grow. When I first met Sue Cooper, I was most impressed with her desire for excellence in her SEO and SEM skills. I knew from the beginning that she was devoted to the technical side of SEO, but after meeting her in person when she visited the United States for training, I also became aware of her focus and great attention to detail when it comes to people skills and communication. Sue Cooper is a name to watch in the future. 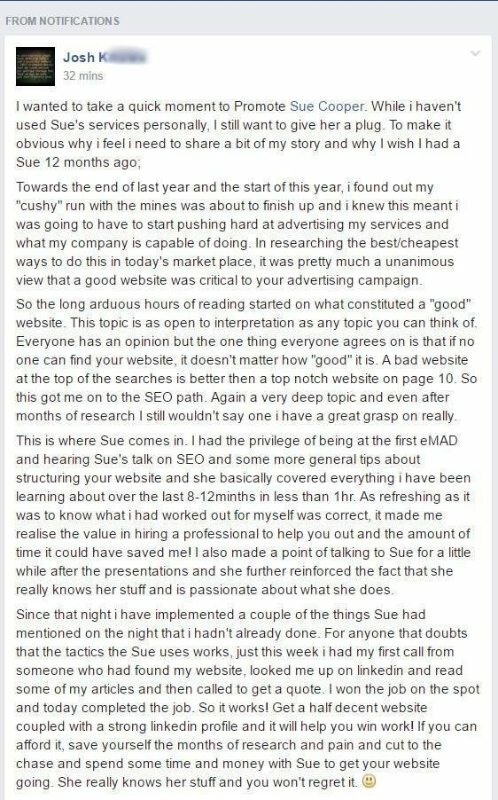 Sue is the kind of person who dedicates herself to the success of her local Australian SEO Workshop students. Once they are trained and experience their successes after training, Sue remains in touch long after the Workshop finishes to provide ongoing mentoring and support. A highly informed educator as well as an excellent mentor, Sue thrives on making sure her students excel in their skills. Strong and solid ethics, highly motivational and my highest recommendation for any business owner needing some help to get their search visibility up to speed and into major spotlights! I really appreciate that i can walk into an technical training and understand what is being communicated. Highly recommend the course, I am new to webpage development and I found Sue easy to understand and a wealth of information. Great day! Daniel is a strategic thinker with a hands-on approach. He is a capable technologist, but more importantly, he is highly effective at applying technology to achieve a goal. Daniel is friendly, collaborative and hard-working. I wouldn’t hesitate to recommend Daniel to anyone. I have collaborated with Daniel on projects since we met in 2013. He is one of my go-to people for all things tech and internet-related. A pleasure to work with and very generous with his knowledge. Daniel uses a methodical approach to growth with proven measurable strategies. I would recommend his services for anyone from start-ups right through to large companies who are looking to grow their business rapidly, and in a cost-effective manner. Sue has been helping me as a technological ignoramus for about eight years now with several websites for three companies. Service has been responsive and successful every time. It’s great to know someone cares about us and acts immediately to help out with good constructive advice and great levels of service. Highly recommended! !